Disclosure: This post was sponsored by Advertise with Bloggers. All opinions stated are genuine and my own. Do you Scrigit? Would you Scrigit? Do you have any idea at all what I'm talking about? If not, you totally should! The Scrigit is one of those tools that you don't know how much you need, until you've got one in your house and you find yourself using it over and over again. I've used it to get candle wax off of my wall (just never mind that story), labels off of toys, and I've even used it to split the tape on packages (which is not what it's intended for, but it worked great just the same), and much, much more! Scrigit tools come with a flat end and a rounded end, making them convenient and effective to use in a variety of situations. Keep one in your car, your purse, your desk, and in the kitchen too!! They are sold in packages of 2 or packages of 5. One lucky winner is going to get BOTH and a $15 Starbucks Gift Card to boot. Enjoy the time you save scraping by kicking your feet up at a Starbucks instead. Save time! Save effort! Even save wear and tear on your fingernails! Have a handy easy to use scraper nearby when you need it. The pocket-sized Scrigit Scraper is a versatile cleaning tool that provides a quick, safe and convenient alternative to fingernails and other types of scrapers as a way to remove small amounts of common substances, such as food, candle wax, soap, paint, adhesive labels, grease and grime, from flat and curved household surfaces, such as dishes, kitchen and bathroom counter tops and floors. About the size of a pen, the Scrigit Scraper is perfect for reaching into tight spaces, grooves and crevices. The tool is also handy for arts and crafts. The size and unique cylindrical shape of the tool, with a different style scraper at each end (patent pending), make it easy to hold, carry around and keep in handy places so you can grab it quickly when needed. The durable specially selected hygienic plastic used to make the scraper is safe to use on most household and automotive surfaces, including Plexiglas® windows. Make Scrigit your essential scraper tool. The rounded wedge shape of the Scrigit Scraper is based on the shape of a finger nail. This tip is excellent for scraping off small spots, getting into edges and grooves, and removing stickers. The flat-edged scraper on top is best for cleaning off slightly larger spots or areas of unwanted materials from flat surfaces and getting into tight spaces. You can purchase the Scrigit Scraper at Amazon where a 2-pack costs $6.99 and a 5-pack costs $9.99. To learn more, visit the Scrigit website, and be sure to visit them on Facebook. 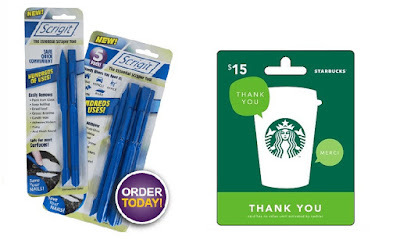 One lucky winner gets both Scrigit packs and a $15 Starbucks Gift Card. U.S. entrants only. This would be so handy for around the house!! We are always having to scrap stuff off the walls, floors and tables! Plus a Starbucks card and you have it made! Where have these things been all my life! They would come in handy on multiple occasions! I would love to Scrigit! these sound like great pens and I love me some pens. Definitely going to check them out. Looks like a gadget I really could use! With 5 kids they have gotten gum stuck on places that I have had to scrape off! This seems to be a great tool to have handy. I like that you can use the Scrigit on Plexiglas windows. Oh man, I could really use one of these. I have wrecked my nails too many times trying to scrape something. Me too! My kid can make all kinds of sticky messes and this comes in handy. I would use the Rounded Edge Scraper to remove stickers! YES! I totally need one of those in my life. What a brilliant idea. Ooh, I would totally need one of these! I hope I win! I love my Scrigits! I have them stashed all over the house and find I actually use them quite frequently! This woudl definitely come in handy for cleaning. I'd use it on labels the most! I'd use this to get hair out of my shower door runners. I could use a Scrigit! I have such a hard time getting labels off of things. How have I not known about this! I want one for my car, my kitchen and my purse! The name is so great too- it sounds just like it looks! Very useful tool, would come in handy on glass bottles. Okay.. so yes... I could really use this. Sometimes when the mail comes in, my Hubs grabs a kitchen knife to open it. That is a big no, no and of course I tell him that is not what my knives are for. I could use a few of these lying around in different places. This sounds very useful. I'd love to try it. I would love to have this to remove the caulking around our tub to replace it with new. This tool would be perfect and I love Starbucks. Oh I want several of these. How cool is this. I need this! I definitely could use a Scrigit! This is something I have never heard of ut have always wanted!! LOL..this seems like the perfect little handy tool to keep around the house. Thanks so much for sharing and for the awesome giveaway! I have 3 little boys, most recently I was scraping up play dough and a pop tart that was stomped on for fun! These looks great! I think the Scrigit product would be great to have in my kitchen tool drawer for all those jobs that I use my fingernails for now. It would save some wear and tear on my nails. Who doesnt want a Starbucks giftcard? I do and I entered! This sounds like something everyone should have. And of course I love the idea of a Starbucks gift card! Ooh yea, getting the labels off would be awesome! This would come in handy when cleaning the kitchen and bathroom. Thanks for the giveaway, I would love the win the Starbucks giveaway! I need one of these! My little boy enters discarded lottery tickets into the computer and this would come in handy. Sounds like a great tool for cleaning! I'd love to try it out. Looks like something I could use . . . plus, I love Starbucks. I have never even heard of this and yes, at the start I had no idea what you were talking about. But I can see how every house needs one. Seems like a handy tool. I need a Scrigit to use around my house. I have these and LOVE them--I gave a couple to my Mom and she LOVES them. My nails are pretty strong but hers are not and I know this product has been saving her beautifully manicured nails many times over by now. Those scrapers would come in handy. I can think of lots of things to use these on. Thanks for the chance! I would love to give one of these a try. This is the first time I heard about Scrigit. What a useful tool! I want one of these. I sure could use this around the house on a lot of projects. Great to have and I will get one...thanks for sharing. This would be so handy to have at my house, in the car and at work plus I love Starbucks. Would love to try the Scrigit out! These are great to have in the house! That's pretty handy! I'm sure I could use it get price tag stickers off things and save my fingernails! These sound like a great handy tool for my craft room!! I need this to get labels off of items. It is such a pain to try to get them off with my nails. These look like some great tools that would seriously come in handy. I hadn't heard of the Scrigit before, but that is a tool I need! I HATE picking at labels, it takes forever, and always leaves that sticky stuff. This IS one of those tools people don't know about, but need to know about. Finally, this product has come to life. I used to use my poor nails in doing these daunting tasks.... Now, Scrigit-ing is never been this easy. I have never heard of this but it sounds so convenient!!! When did it come out on the market? I don't think we have it in my neck of the woods! What a great idea to into the little spots to clean or chalk. This would be wonderful to win! Thank you for the chance! This would be really nice to have to clean out the corners in my house that are hard to reach; thanks for posting! Never heard of this before, would really like to try it. Thanks for posting! I have been trying to take care of my nails and this would help because I definitely use them to scrape off tags and ruin them. Never heard of this before, and wonder how ive lived without it! I could totally use one of these. I have a certain 5 yr old who love to put stickers on everything. I would love to use this in the bathroom. These would be great for me to use at work. This is the first time I heard of a scrigit. It sounds like an awesome tool. This looks so handy! Sometimes it's so hard to clean the little stuff - this would really help! I've never heard of such a thing, but it does look useful. This would be a blessing to have for my husband who is always doing DIY things around the house. I am sure it would have come in handy when he was scraping the shower recently. those would be great for getting sticky things unstuck. This would be so useful for many little things. You are so right! I totally think I need a Scrigit. Those hard to remove items that kids put all over the house are so hard to remove, especially stickers. This would come in handy. I've never heard of a Scrigit but it would be a handy dandy tool to have. Thanks. this would be great to have around. don't have anything like it...i'm always grabbing a sharp knife to get labels off! I would love to use scrigit to get gum off my floors. Seem to have this issue constantly. First time I have heard of this but sounds really handy for scraping stuck hard to remove food - a better alternative than the knife :) Thanks! I could use one of these plus I love Starbucks. I would love to have a gift card to Starbucks. I've not seen this product before, but boy does it look useful. I'd love to win as I know it would get a lot of use, starting with the tiles in the shower. The Starbucks gift card will be handy when traveling. These look useful and I love starbucks! This sounds like an exceptional idea to take label's adhesive residue off of objects. I am going to find this and use it. We're about to move so this would be really helpful cleaning up! This sounds like a very handy tool to have. I love Starbucks so this is great for me.